Relays, where have you been all my life? I can’t believe this hadn’t occurred to me before: I can get the T-shirt, the medal, and the beer, and I don’t have to run the whole way! Genius. 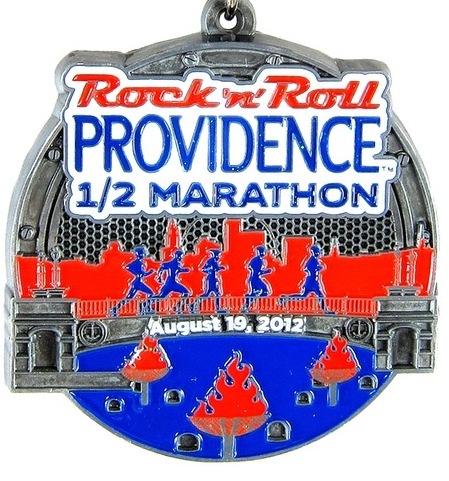 I experienced this fabulousness first-hand last weekend at the Rock ’n’ Roll Half Marathon in Providence, Rhode Island. I wasn’t keen on doing another half so soon after the SeaWheeze, so Hubby and I signed up to run the two-person relay. In keeping with the rock ’n’ roll theme, we declared that we would tackle this race in jorts. 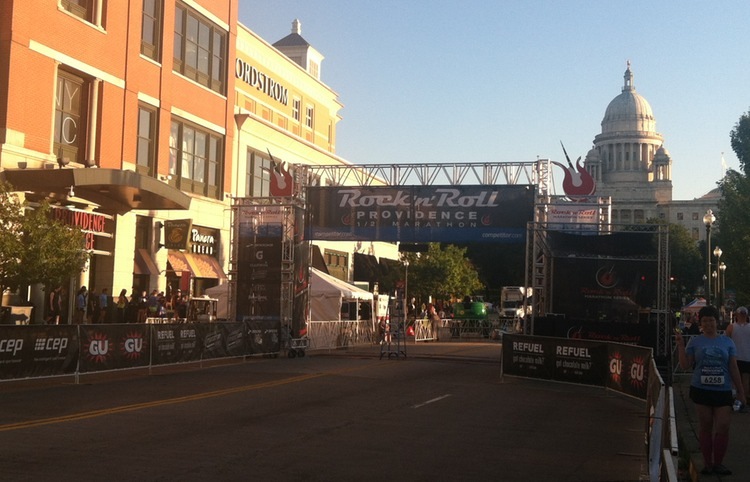 Rock ‘n’ finish (uphill) in downtown Providence. Yes, you read that right. Jorts. We had been looking for the perfect run to send some denim love the way of Jill at JoggingJeans.com, running blogger nonpareil, and this was clearly it. Also, we’re not very rock ’n’ roll, so we needed all the help we could get. The situation clearly called for cut-off jeans. But firsts things first. We picked up our bibs and shirts the day before the run at the customary race expo, where all the sparkly-headband vendors in the world come to mingle (seriously, how many headbands do people need?). 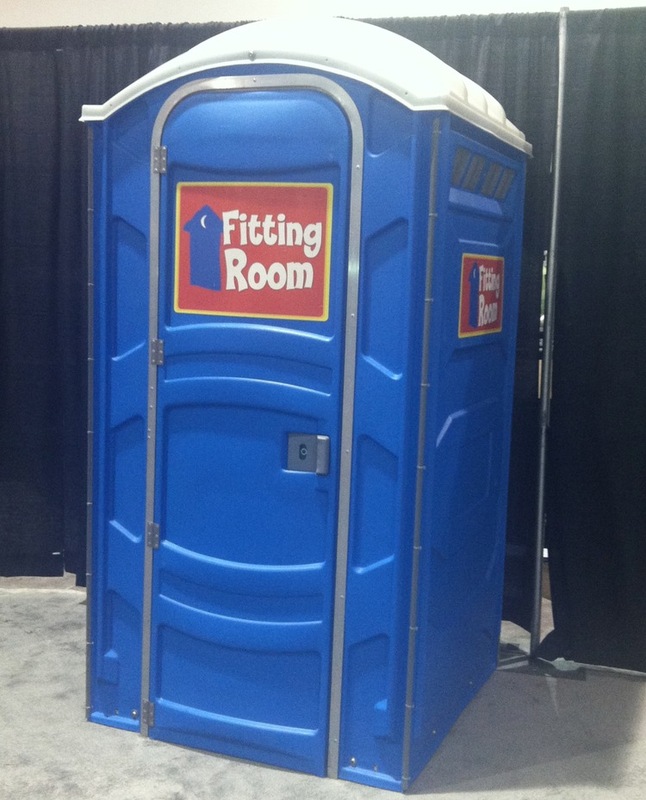 There we spied the most fabulous thing: port-a-loo fitting rooms. It’s amazing – and slightly disturbing – how much my life now revolves around the malodorous blue plastic zones of hell that are race port-a-potties, so I definitely appreciated the humor. It also made me heart Brooks just a little bit more (the “loos” were in their section, although I don’t know who was responsible for them). The event itself was on a glorious day. I’m so happy I can finally write that, after spending the past three months running in a pressure cooker. I started among the speedy folk. The run was corralled at the start, and Hubby wanted me to go into one of the speedier zones so I wouldn’t get caught up among the slowpokes at the back and take a gazillion hours to get to him. Er, I am one of the slowpokes at the back. Anyway, I started in corral four, which would have been fine had the course not immediately taken us up a giant hill. So epic was this slope that normally I would have walked it (you know, because I am crap and can’t run hills to conserve my energy). But I didn’t want to shame myself among the hard-core corral-four folk, so I ran like the wind and nearly expired. How rock ‘n’ roll are we?! Did I mention I was wearing jorts? Tight jorts? Jorts that rode up in various places and had little wisps of denim that annoyingly crept down the back of my legs? I was surprised by the lack of jorts-related comments I received (Hubby got lots). Then I realized it was probably because they were so dang tight they probably looked like stretchy gym pants. 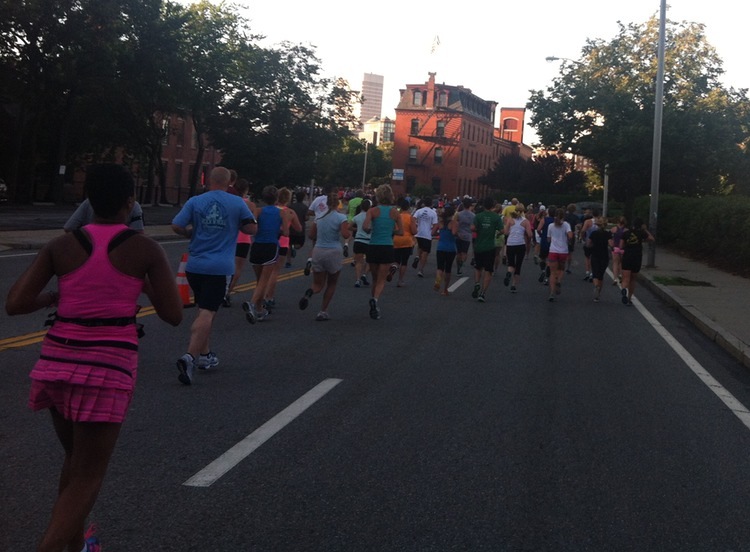 Or maybe the other runners were just too embarrassed for me to look in my direction. 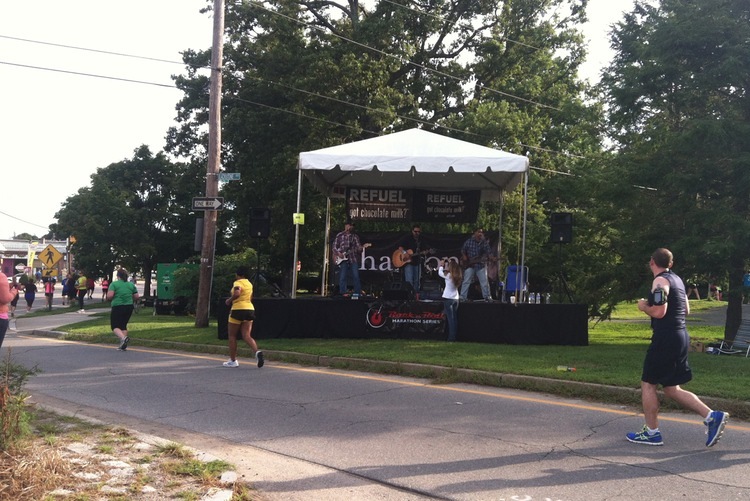 Appropriately, there were lots of bands playing along the course, and a great lineup of groups at the finish. I’d heard good and bad things about these Rock ’n’ Roll events, but this one was fantastic and I’d do it again in a heartbeat. 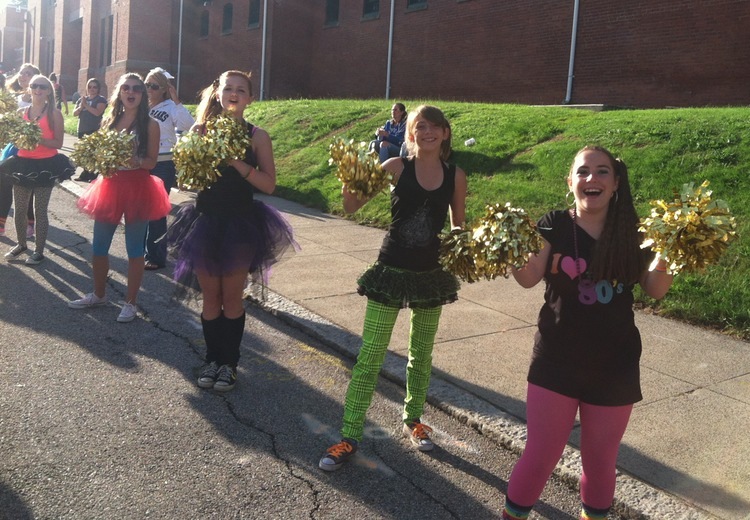 How can you not love a race that has cheerleaders waving golden pom-poms at you as you go by? There was a giant hill at mile four that knocked the wind out of me. It was tough enough to walk it let alone run. But on the other side, a glorious, glorious downhill took me right into the relay exchange and into Hubby’s open arms (OK, he really just wanted the stick). My relay buddy made up for my slowpokery with a blistering eight miles and we came in 22nd overall in the two-person relay category, and 13th among the co-eds. Not a bad showing, I thought, considering we were both in denim. The aftermath: Fruit cups, bananas, and popsicles for those at the finish line; bananas for the relayers. 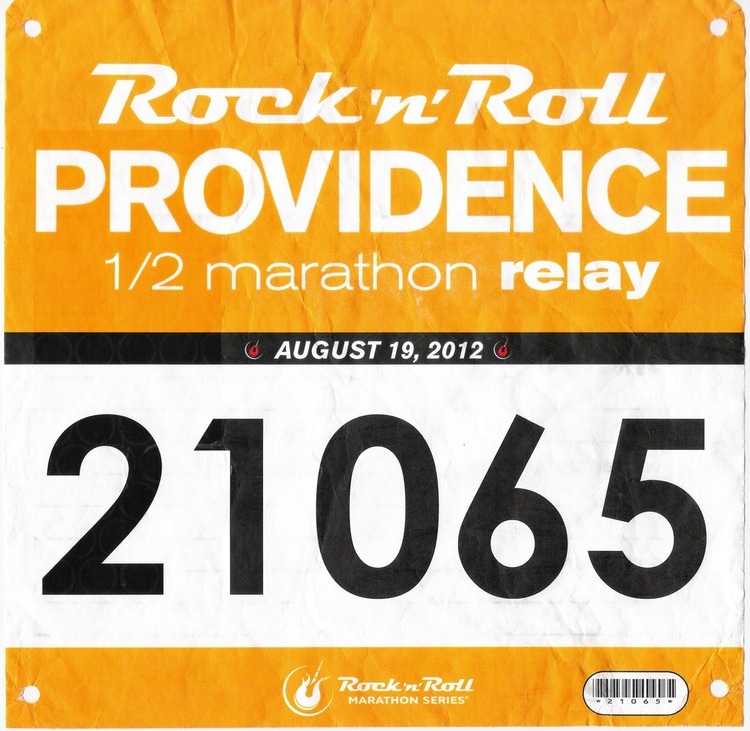 This entry was posted in 52 Weeks, 52 Runs, Humor, Running, Sports and tagged half-marathon, Providence, Rhode Island, Rock n Roll race series. Bookmark the permalink. Love it!! You guys rocked it!! Although… I thought that, in the photo you sent me a few weeks ago, Andrew’s shorts were much shorter….. The world needs to see version one! Maybe a Halloween 5K then it won’t be quite as embarassing? Ha. I’m not sure the world is ready for version one. I always thought that you were the best race recap writer out there. Now, I am sure of it! LOVE LOVE LOVED this one. Read it multiple times. And, of course, I especially loved the jorts! You two made my day. Love you both! I’ve never heard of Jorts! You haven’t really lived till you find out what jorts are. This is awesome! I don’t think I’d ever be able to try running in jorts. The chafing potential is just too great, haha. Congrats on the relay! HAHAHA!! Love the jorts. I am going to try and convince my husband to run a relay with me, a medal with less distance, I’m all over it!! Sounds like fun and I like the idea of using the drum stick to poke people out of the way! Might have to adopt that strategy for races in the future! LOL! It’s these posts that make the running with you so much fun! Way to go!!! And thanks for teaching us about Jorts – new vocab word! I am doing the Rock ‘N Roll 10K in New York this October with my man, no relay option, but now I am going to search for a relay we can do! Fun read, thank u! Haha this post was awesome! Loved reading it! Seriously, why there so many headband vendors at the expo?! I also thought the mirrors were hilarious. Great job and love the outfits! I’m totally going to ask my husband to do one of these relays with me! I think the headbands have reached saturation point, although I do see a lot of them on the ground at runs so maybe that explains it? 🙂 You should definitely get your hubby to do a relay. It was a blast! I’m going to do them as often as I can now.